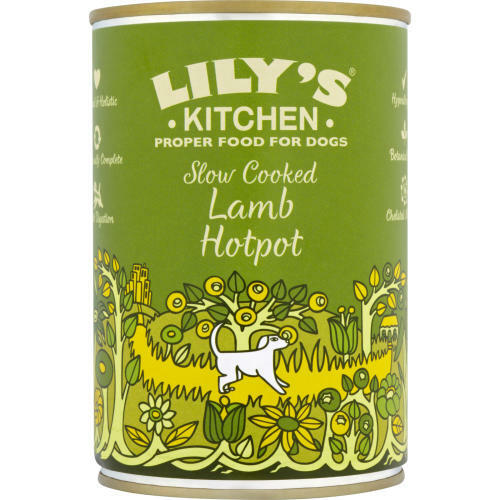 Lilys Kitchen Lamb Hotpot is a delicious complete Holistic wet food for dogs made with fresh cuts of Lamb, organic brown rice and lots of organic vegetables and fruits, heaps of nutritious herbs, plus all the essential vitamins and minerals your pet needs for a healthy diet. A superb recipe for health and vitality. None of our foods contain any gloopy stuff - just whole pieces of real food. Your dog will love you for feeding them good proper food! 60% Fresh meat: lamb 60%, organic brown rice, organic peas, organic squash, organic apple, organic pearl barley, organic broccoli, blueberries, organic carrot, flaxseed, Omega 3 & 6. Botanical herbs: golden rod, nettle, aniseed, celery seed, rosehips, marigold petals, cleavers, kelp, alfalfa, milk thistle, dandelion root, burdock root,Vitamin A 3000iu/kg, Vitamin D3 200iu/kg, Vitamin E 30mg/kg, Biotin 300mcg/kg, Zinc sulphate monohydrate 15mg/kg, Manganese sulphate monohydrate 3mg/kg, Calcium iodate anhydrous 750mcg/kg, Sodium selenite 300mcg/kg. No rendered meats, carcass or derivatives, nothing Genetically Modified, no artificial preservatives, colours, taste enhancers or sweeteners. No wheat, corn or soya. We use only whole meats, grains, fruit and vegetables - to produce a delicious, nutritious, digestible food for your dog. Suitable for Puppies too.